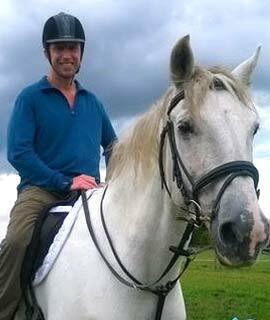 I am very interested in commissioning a portrait of my partners much loved horse who had to be put to sleep recently. My problem is I only have a very limited amount of photos of the horse and i’m afraid not many of which are very good quality or well framed. I would be interested in receiving your opinion on whether it would be possible to produce a credible painting of Radley from these pictures. I am very impressed with your website and of the quality of both drawings and oil paintings presented their in. Very professional. Attached are the photos. The last 2 were taken on the day he was put to sleep and as you can probably see he was not in good condition due to his illness; I feel though that these pictures capture what a beautiful horse he was. We knew that we had to create a portrait for Richard so that he could present it to his wife on her birthday. We knew it would mean the world to them both and so we set about working out how we could use Richard's photos for the portrait. Read on to find out more. Don’t forget to share our page using the buttons below! 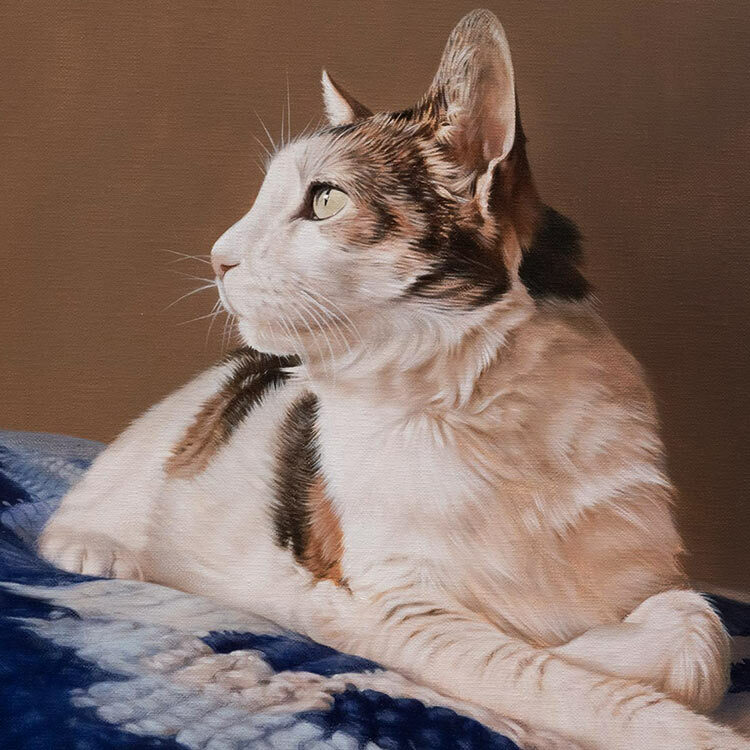 As you may have already read above, Richard commissioned an oil painting Radley, not long after he passed away, as a surprise gift for his wife's birthday. Richard didn’t have many photos of Radley and the photo on the left, where you can see Richard riding Radley. was their only good quality close up photo. There were a number of photos of him being ridden in a field however and this was really helpful for adding a background to this photo. Nicholas painted a blue sky and lighter green spring grass in a place where Radley lived and enjoyed life. The painting was a 16 x 12 inches oil on canvas traditionally hand painted by Nicholas and framed by our amazing bespoke framers who hand craft their frames for us. We worked closely with them to create an aged look with blues and purple tints to match Radley's dapples. We also had our engravers create a plaque for Richard too which completed the whole commission of beautifully. Scroll down to see more photos and read a lovely testimonial from Mandy too. I just wanted to write and thank you both for bringing my beautiful horse Radley back to life again for me. I opened the gift from Richie yesterday and was over-whelmed with emotion. Nicholas captured Radley's character in a way I didn't think was possible in a painting. Radley was a horse I had longed for and searched for since I was a little girl and finding him was a dream come true, so when I had to say goodbye to him in March this year it was one of the hardest moments of my life. His memory will forever be etched in my mind but now I get to look at him every day and see the gentleman amongst horses that he was. Thank you. Through your incredible talent Richie has given me a gift that I can cherish forever and something that will remain priceless to us both. 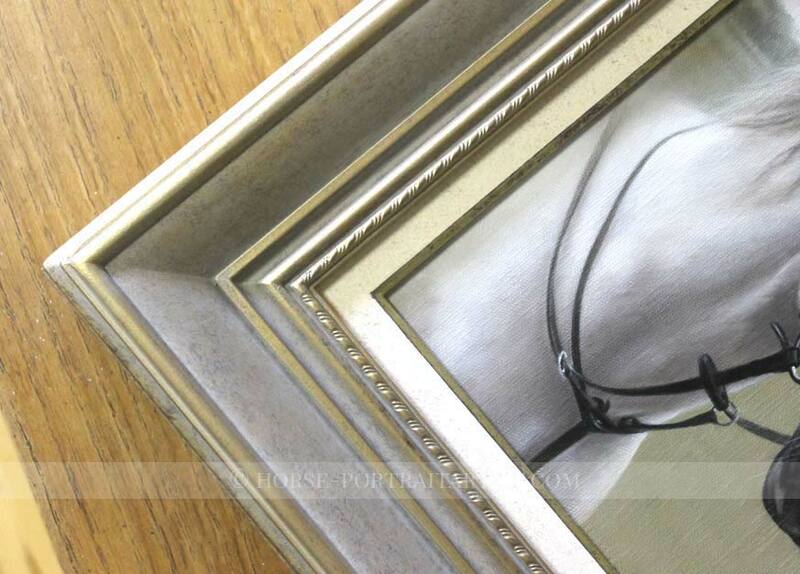 View a couple of photos of Radleys oil painting framed. If you would like us to arrange framing for you, we work with a wonderful framer who hand makes their frames bespoke for our clients. They are absolutely stunning. 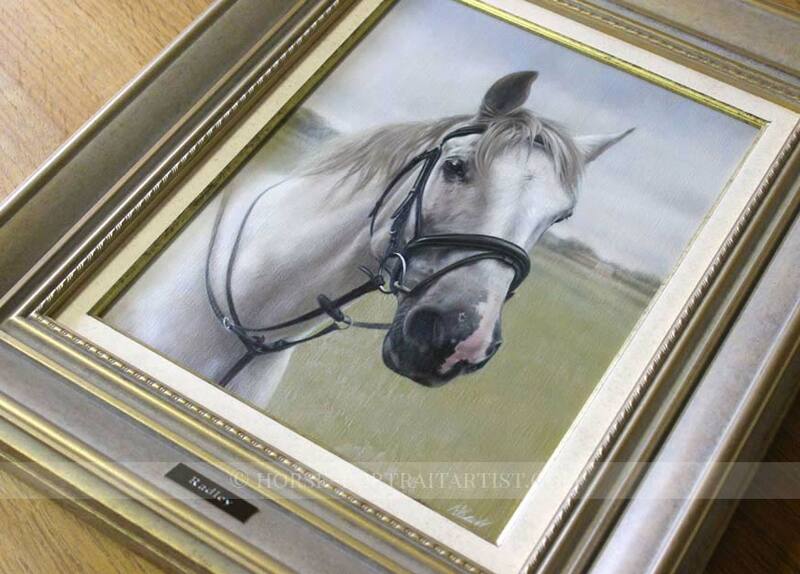 We hope you enjoy viewing Radley's horse pet portrait framed below. If you have limited photos of your horse, you are more than welcome to email them to us, so we can check if we are able to use them. 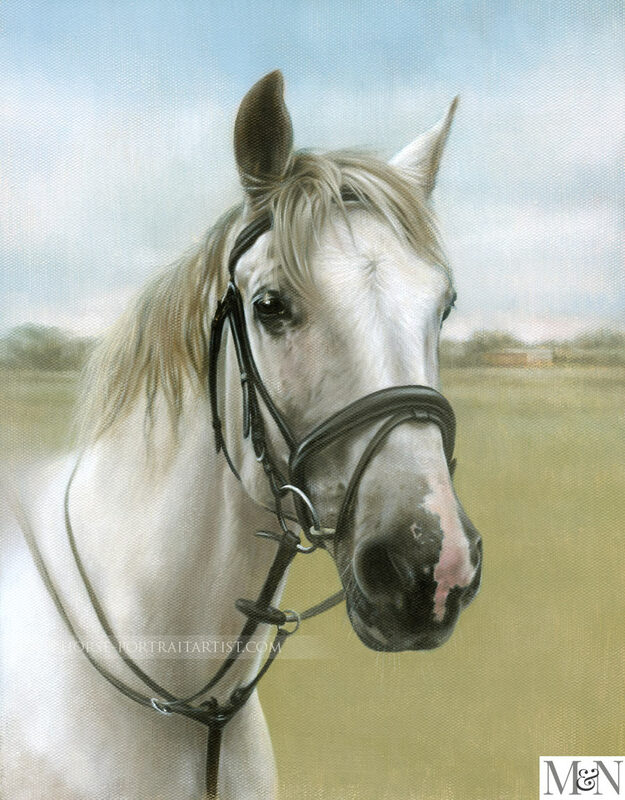 We always create designs for clients to see of how the finished painting's design will look and we work closely with our clients so that they receive a portrait that is perfect for them and that captures every detail of their horse, down to the last dapple. You are more than welcome to email us you photos today by visiting our Horse portraits contact page.